Programs, tips, and strategies for reducing bullying using SEL techniques. Unlike high-level violence -- encounters involving weapons or grotesque physical abuse -- bullying is characterized by intimidation, teasing, stealing, physical attacks, and inflicted trauma. Bullying victims experience an electrochemical cyclone of abnormal brain responses. Stress-activated cortisol bombards the memory center, killing nerve cells in the hippocampus, and attacks the immune system, which often causes depression and anxiety. Our brains take a fifth of a second to label a stimulus as good (something to be approached) or bad (to be avoided). An attack quickly deprives working memory of oxygen and glucose and impairs academic performance. Try solving algebra equations after being ridiculed and slapped at the bus stop. To frame and address bullying, researchers prefer the ecological-systems perspective, which suggests adjusting multiple conditions: home and school, intrapersonal and interpersonal development, peer groups, the community, the media, and cultural norms. Complex problems sometimes require complex solutions. Caring School Community: a school-based and after-school K-6 program instituted in over 15,000 schools since 1980. Responsive Classroom: an organization that provides professional development and resources to K-8 teachers. Second Step Bullying Prevention Unit: a K-5 curriculum unit and teacher training program with resources for families and administrators that help students learn social problem solving, emotion management, and empathy. Roots of Empathy: a K-8 program where students identify a real-life baby’s emotions and needs (seen in this adorable video). 1. Help students connect with each other. On the first day of class, I ask students to stand in a tight circle and notice the color of their peers’ eyes, which takes exactly the amount of time needed to establish a visual connection. Increased eye contact develops intimacy and increases small-group participation. For the rest of the semester, learners make eye contact and call out each other’s names whenever entering my classroom. 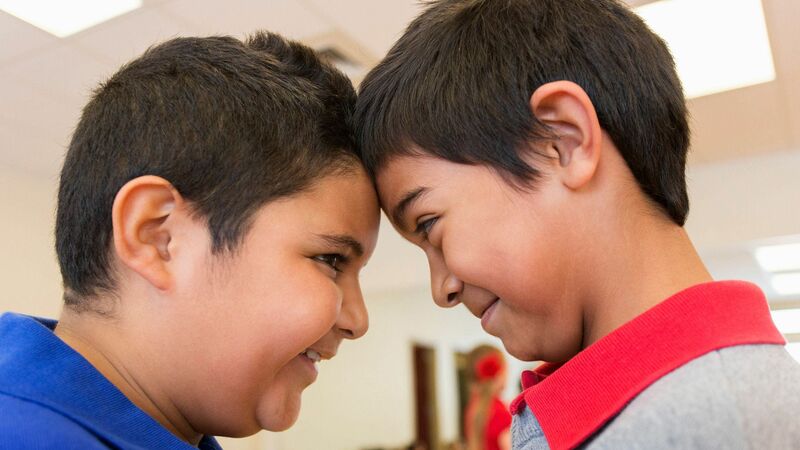 Because touch builds trust and cooperation, we start every class with a group fist-bump (instead of handshakes, which spread 90% more bacteria) and recite a secret class motto, which establishes community. 2. Help students take control of their emotions. To help us flee or fight predators, our 1.9-million-year-old brain is “hard-wired to experience fear and distress,” writes Dr. Melanie Greenberg. Although gratitude intervention research is inconclusive, my students report feeling elevated when we conduct 90 seconds of “GNG,” a ritual where each student quickly shares good news or something for which they’re grateful. It’s hard to be anxious and appreciative at the same time. This initiation sets a positive tone and signals that students have the capacity to direct their feelings. 3. Help students reduce anxiety. A brain break that I’ve integrated into my classroom routine involves singing the alphabet song using Disney movie words. That makes kids laugh, and as the Mayo Clinic reports, laughter reduces stress. Additionally, I teach all of my students the box-breathing technique that Navy SEALs use to activate the parasympathetic nervous system and calm down before a mission. For four seconds each, kids inhale through the nose, hold their breath, exhale through the nose, and hold their breath again. They repeat those steps a few times as needed. To prove the technique works, I ask students to compare how much they have slowed their pulse by using the free Instant Heart Rate app (Android, iOS) before and after box breathing. Most students are surprised at how much they’ve lowered their heart rate. The optimal condition for learning is relaxed alertness. To show what this state feels like, I direct students to stand and compete to see who can simultaneously look relaxed and focused. Elite student athletes, because of their mental and physical training, can instantly turn their eyes into lasers while the muscles in their bodies loosen -- thereby modeling relaxed alertness for everyone else. 4. Help students develop empathy. Fortunately, many strategies that are backed by social science prevent extracurricular terror. Which SEL approaches to bullying does your school use?